Future Brown are the first supergroup to emerge in 2015: A collective of producers with roots in Kuwait, Los Angeles, New York and London that has set out to change the face of club music with its idiosyncratic blend of grime, rap, reggaeton, footwork and house. Geeta Dayal met the four-piece in Los Angeles prior to the release of their debut album. 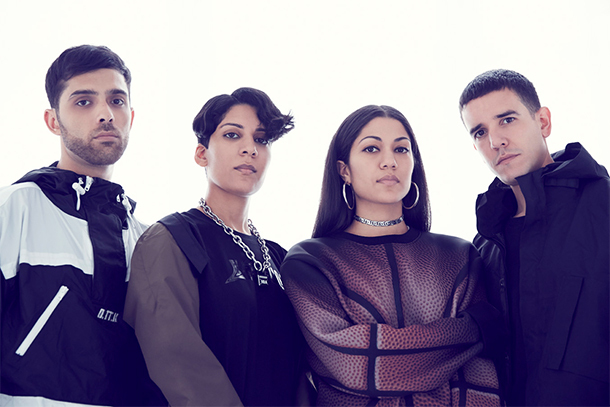 I meet Future Brown – the team of electronic musicians Fatima Al Qadiri, Jamie Imanian-Friedman, Daniel Pineda and Asma Maroof – in the Koreatown neighborhood of Los Angeles. Koreatown feels surreal and almost psychedelic on this bright, hot January day in LA. Most of the signs in Koreatown are in Korean, not in English; looking at the riot of Korean markets, cafes, and restaurants, you could almost imagine that you’re in downtown Seoul. But there’s a particular LA flavor – the long, wide avenues are lined with tall, swaying palm trees, and rows of Art Deco buildings with terra cotta facades. I pass by waves of Korean and Latino immigrants, students, and hipsters, and head up the stairs of a nondescript white tower block. Inside Maroof’s small Koreatown apartment, Al Qadiri, Imanian-Friedman, Maroof and Pineda are sitting in a circle, surrounded by synths, samplers, and laptops. Future Brown’s self-titled full-length debut has dropped this month on Warp Records, but they’re already ahead of themselves, busy recording their second album. Their Warp debut features collaborations with a bewildering array of vocalists, many of them women -rising R&B star Kelela, the rapper Tink, and longtime Ludacris collaborator Shawwna, for starters. Future Brown are a bit of a supergroup themselves, even without all the high-profile guests: Al Qadiri recently caught attention for her solo album on Hyperdub, Asiatisch; Imanian-Friedman, also known as J-Cush, runs the small but well-regarded ‘global club music’ label Lit City Trax, which includes releases by Traxman, DJ Marfox, Spinn and the late DJ Rashad; and Pineda and Maroof are better known under their duo name Nguzunguzu. As the story goes, the name Future Brown was dreamed up in the haze of a magic mushroom trip in the forest. It’s a catchy name for a band, but is it also meant to be a conceptual statement, or a comment on the band’s own potent mix of ethnicities? The members of Future Brown hail from a wide variety of backgrounds – Al Qadiri lived for many years in Kuwait; Imanian-Friedman is half-Iranian; Pineda is Puerto Rican by way of Oklahoma, and Maroof is of Indian descent. But Al Qadiri is wary of reading too much into the name. “I think that regardless of whatever you name yourself as a band, if it’s not your real name, that’s going to be a question that’s going to be asked of you almost for the rest of your career,” Al Qadiri says. It’s hard to pin down Future Brown’s sound, which fuses elements of hip-hop, R&B, grime, and club music. The disorienting track “Room 302,” featuring Tink, sounds like a syrupy R&B slow jam cut with aggressive rapid-fire rap interludes. “Talking Bandz,” featuring Shawwna and DJ Victoriouz, has a dark, menacing grime undertow. Imanian-Friedman spent ten years living in London, immersed in a crash-collision of sounds and cultures. “Grime is more of an attitude,” says Imanian-Friedman excitedly. In London, he says, “you can be in one area and hear one sound, and walk another block and hear another sound,” he says. “Going from one continent to another, that’s the sound of London.” In many ways, Future Brown sounds like a group that could have come from London.